Served from 11 AM until 2 PM Sundays. All brunch entrees are served with fresh fruit and sonitas. Scrambled eggs with chorizo sausage smothered with green chile with pork. Served with two flour tortillas. Scrambled eggs, avocado, tomato and onion in a flour tortilla topped with vegetarian green chile or green chile with pork, jack cheese, sour cream and guacamole. Scrambled egg enchiladas filled with chopped green peppers, tomato and Canadian bacon, topped with chile con queso. 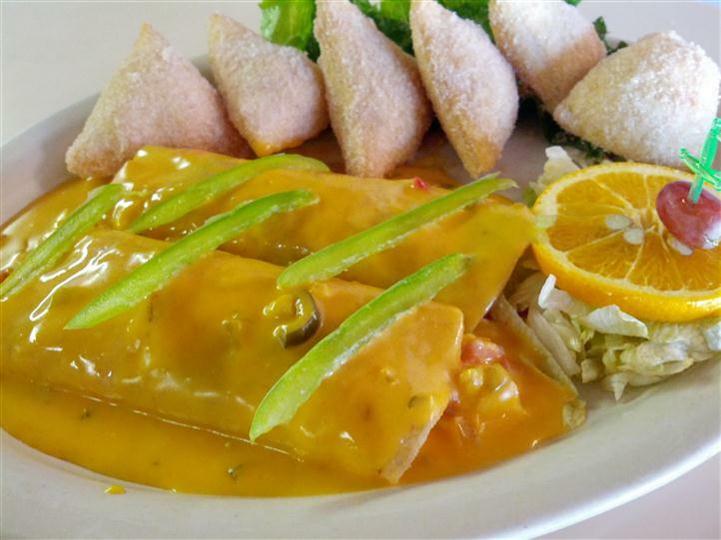 Scrambled egg enchiladas with cheese, topped with red chile and chile con queso, sour cream and green onions. Three egg omelet with diced avocado, Canadian bacon, black olives and chile con queso. Three egg omelet filled with cheddar cheese, topped with chile con queso. Topped with cheese and your choice of chile. 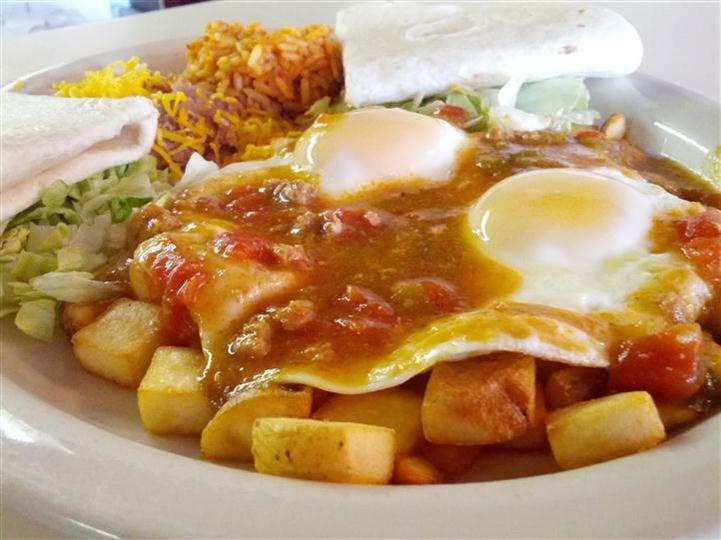 Two fried eggs smothered with green chile with pork, served on fried potatoes with refried beans, rice and two flour tortillas. Breakfast burrito filled with scrambled eggs and your choice of 3 ingredients. 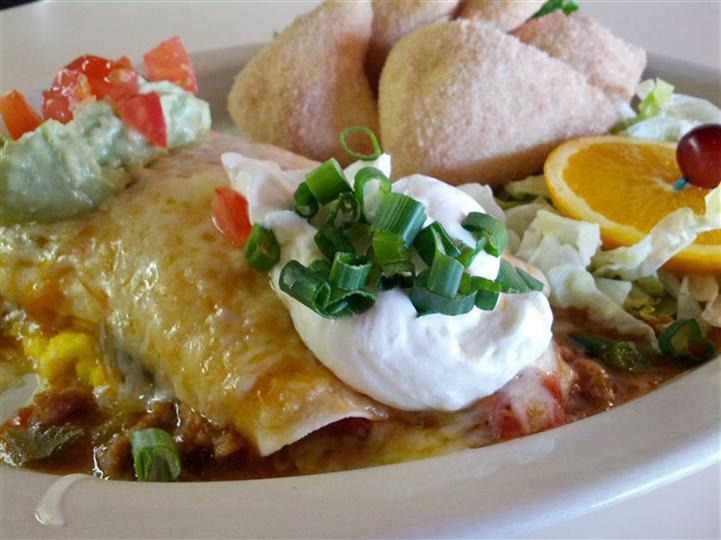 Topped with choice of chile con queso, green chile with pork, red chile or vegetarian green chile. For each additional ingredient, add .59. Flatbread topped with scrambled eggs, Canadian bacon, green peppers, tomatoes, chile con queso and melted cheddar cheese. The Kentucky Breakfast - Maker's 46, a touch of real maple syrup, cider and ginger beer.